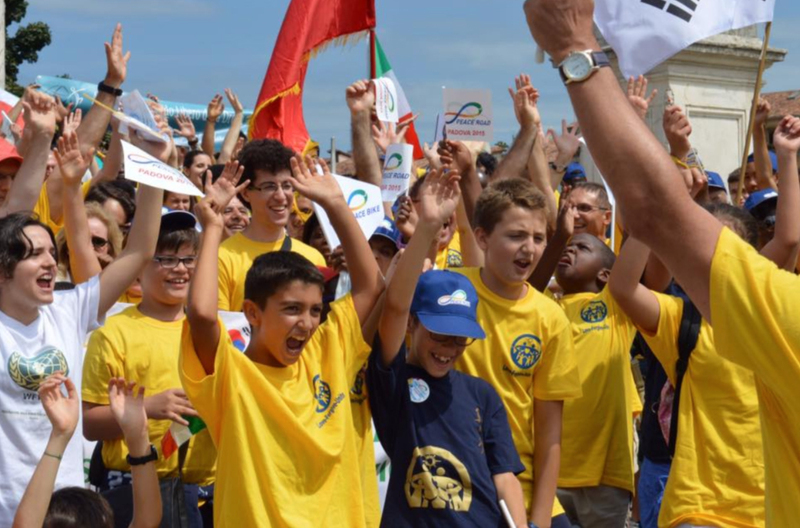 FFWPU Italy: On July 26, Italy and San Marino held the Peace Road together. We held the Peace Road march at the beautiful Prato della Valle Square in Padova, the biggest square in Europe. Padova was chosen due to our long cooperation with the City Hall, that this time offered their help and sponsorship very quickly. All together there were 18 organizations and churches, including five Unificationist federations (FFWPU, UPF, WFWP, CARP, IRFF), plus a priest from a Catholic University, two Protestant churches, one imam from a Muslim community and a few other associations: for immigrants, fighting drugs, supporting children, and so on. The RAI, national TV station came, filmed the event and conducted a few interviews. On the same day, TV news covered it twice. In the morning it was cold and rainy, but as soon as people started to gather a beautiful sun came out, with a fresh and lovely wind that preserved us from burning our faces under the strongest sun ever experienced during this month. They organized a gazebo with a podium, from where the key people gave short speeches to inspire the participants. It was wonderful, the spirit of all speakers, who could catch perfectly the meaning of the event, including the Catholic priest and the other leaders that expressed their appreciation of Rev.Moon. Especially meaningful was that it was a reminder to everybody that the lives Rev. Moon and Rev. Hak Ja Han Moon have been dedicated for the sake of the world. More than 300 people started to march around the square, chanting: “If you want to change the world, more and more you have to love” “Unity, unity, to change society” “we fight for peace, true love is our weapon!”, or similar slogans we had prepared in advance. We sang all together “Urie Sowonun Tongil” and people passing by started to gather around us asking questions. Some people were so moved by our content and initiative! We decided to bring all our children with us, even the youngest, to give them a wonderful memory to keep in their lives. It was a memorable experience for everybody else, too. They found again the spirit of mobilization of the early times of out movement, and it was really exciting!